DOTmed HealthCare Business News is a dynamic and efficient advertising option in the healthcare space. The unique content of our Industry Sector Reports provides our readers with vital information they need and can use every day to make better buying decisions. With a circulation of over 30,000 that reaches the key influencers and decision makers across the healthcare spectrum - plus our competitive ad rates - DOTmed HealthCare Business News is the ideal medium for any product or service designed for the healthcare industry. The business environment inside a hospital is unlike any other. The multiple department heads and de-centralized nature of a hospital create a business structure in which many people are involved in major purchase decisions - and no two hospitals operate in exactly the same way. So that means you - as an advertiser - have a large number of people to reach. 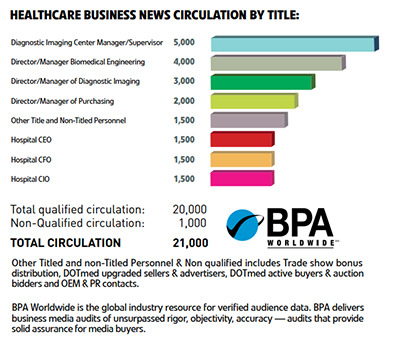 DOTmed HealthCare Business News' unique demographics delivers those all-important people: The C-level executives and administrators, and key department heads. 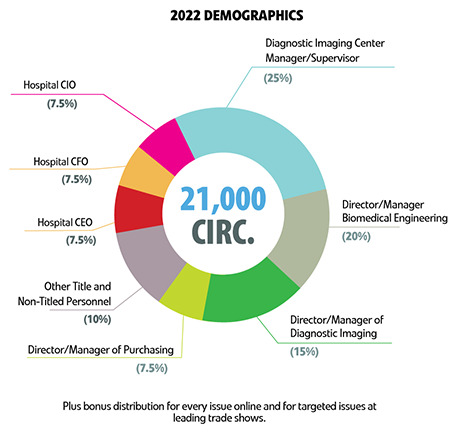 In addition, DOTmed HealthCare Business News reaches over 3,000 top imaging centers and thousands of leading ISOs, OEMs and equipment brokers and dealers, giving you virtually all the major players in the healthcare space. DOTmed HealthCare Business News is published by DOTmed.com - the world's leading, public marketplace for buying, selling and auctioning medical equipment and parts online. 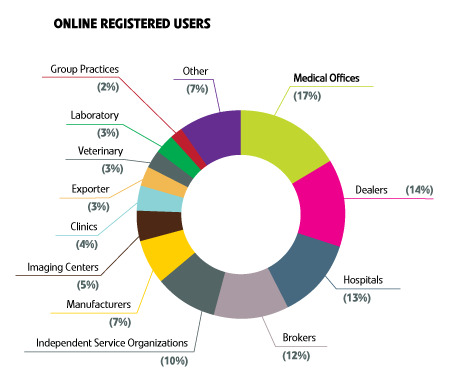 DOTmed.com has over 270,000 registered users. Included among them are the medical industry's leading equipment sales and service companies. This gives us access to a database no other publication can tap into. DOTmed helps readers stay ahead of the curve with keen analysis from IT experts on what the latest technological developments mean for the industry. One of the great universal themes in healthcare is the need to lower costs without compromising care. Every month we bring in an expert on a particular aspect of the hospital enterprise who shares ideas about how to mitigate damage to the bottom line. Previews of the most important upcoming industry shows are presented here. Readers are also offered a calendar of events for the months ahead. Every month we select a U.S. hospital and focus on its accomplishments and conduct a Q&A session with the hospital's leadership. A tidy recap of the biggest breaking news stories of the month, taken from our online Daily News. This is where you go for the latest current events impacting the industry. Each month, we present a key figure in the health care sector and his or her predictions about where certain aspects of the industry are headed - from world-renowned surgeons, to industry innovators, to best-selling authors (sometimes all three), the "Future of" column offer serious food for thought. If you want to reach the key influencers and decision makers who drive purchasing decisions, HealthCare Business News is your best advertising vehicle. Each month DOTmed emails a digital copy to 43,000 users. New sponsorship opportunities available. Contact us for more information! "Our ability to generate business from DOTmed is the best! It has all been terrific." Thanks very much to the DOTmed Ad Team -- I appreciate your hard work and attention to our account. I am very pleased with our print and online advertising package, and your continued support. Advertise in the issues featuring the Industry Service Reports and/or features matching your products and services for maximum results! Download This Calendar Here. PACS and the enterprise – How are new software solutions making radiologists more efficient and connected to the hospital? AI all around us – No longer a buzz word, we look at some of the ways AI is entering the frontlines of imaging. Proton therapy – How are proton providers ensuring children have access to their care? What's new in C-arms and tables? What's new in patient monitors, infusion pumps and testing equipment? What’s new in PET and SPECT? What's new in breast imaging? What’s new in radiotherapy and proton therapy? What's new in scanners and coils? What’s new in DR/ fluoroscopy? What’s new in digital detectors? Insertion Order Closing Date: Insertion orders must be received 45 days prior to the month of publication for all issues. Materials Deadline: Ad materials must be received no later than 35 days prior to the month of publication for all issues. Cancellations: Ad cancellations are not accepted after the Closing date. An advertorial lets you present a detailed and complete "sell story" about your company and services in an "editoral' format. You provide the content, DOTmed will help you "polish" it, and provide our quality design services free of charge. List price: 1-Page Advertorial, $5,000. 2-Page Advertorial $8,500. All ads are full color and 1/4 page in size. Any 5 consecutive issues for $3000. All 10 Issues per year for $5000. 1/4 page Artwork Size: 3 3/8" x 4 7/8". Includes your ad on DOTmed.com's homepage. 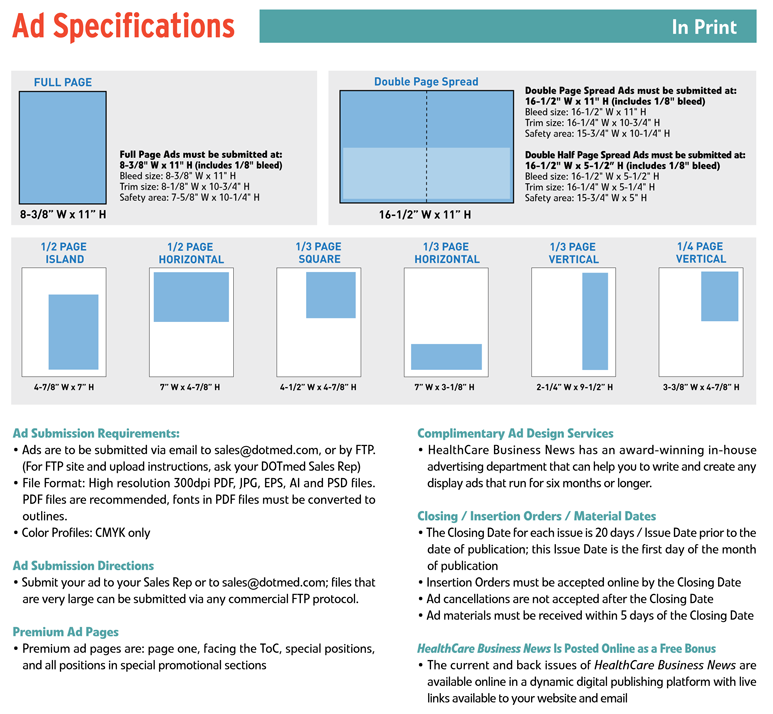 Bleed size: 8.375" x 11"
Trim size: 8.125" x 10.75"
Safety area: 7.625" x 10.25"
When a full page ad is printed it is printed at the bleed size. After it is printed it is trimmed to the trim size. The safety area ensures that any important copy or design elements are not too close the edge of the page. Final ads must be submitted at the Bleed size of 8.375" x 11"
Click here to download a full page ad template which has bleed, trim, and safety marked on it to use as a guide when creating your ad. Essential live matter on full page bleed and fractional bleed ads should be kept at least 1/2" from all trim edges. Bleed ad sizes include a 1/8" bleed on all sides.